Our Far South: Ross Sea adventure playground for Petrel heads. 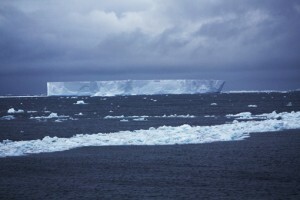 Tabular berg amidst pack ice. Photo Anton van Helden, copyright Te Papa. As we entered the Ross Sea we lef the band of large ice bergs behind us, and entered a fairly calm Ross sea. I kept a morning vigil on the bridge looking for whales. it was not until mid afternoon that we saw our first, a small and rapid antarctic Minke whale Balaenoptera bonarensis. These animals are still hunted by the Japanese as part of their “research” programme. They are also hunted by Killer whales! Later in the day we caught asight of a small pod of Type A killer whales. The different types of antarctic Killer whales have been ascribed the letters A, B and C. they are not only distinguishable by their looks but also by their feeding strategies. Type A specialise in the hunting of Antarctic Minke whales, Type B seals on Pack ice, and type C that are the most southerly form that feed primarily on fish near the continental ice edge. So many whales were taken out of this region, it is scary to think that so few species have made any kind of recovery. In a matter of a few decades the population of Blue whales had been reduced from about 250,000 animals to probably less than a hundred, they are now estimated to number about 2000. 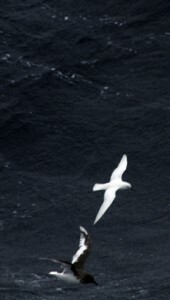 Antarctic petrel and snow petrel. Photo Anton van Helden, copyright Te Papa. The boat has had a few constant companions since coming into the Ross Sea, which by the way is an enormous body of water. 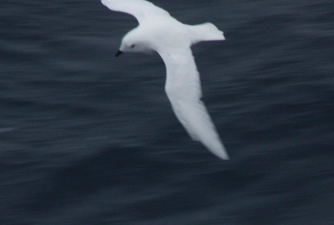 The Antarctic Petrel with their brown and white markings have been flocking around the boat, and along with the white snow petrels have been feeding in the disturbed waters of our wake. We are heading down to Cape Crozier where we will rendez-vous with a Sanfords fishing vessel, as one of their crew is joining the Our Far South trip. We still have a few hundred Nautical miles to run. Currently we are just over 73 degrees south. Miller’s reputation for being detail oriented is clearly visible on the screen. It incorporates some substantive messages about supernatural beliefs and ecological concerns. Really enjoying your blog. Sounds like an amazing experience.